Steve Martin and Goldie Hawn star in this hilarious romantic comedy about the consequences of "stretching" the truth.When architect Newton Davis' girlfriend Becky (Dana Delany) turns down his marriage proposal, his newly-built dream house suddenly becomes nothing more than an empty monument to her rejection. That is, until a chance encounter with Gwen (Hawn) turns his life upside-down.Intrigued by Newton's story, Gwen visits the house and decides to move in on her own. Resourceful and creative, Gwen is soon fixing up the house and charming Newton's family and neighbors - and all the while passing herself off as his new wife! Gwen even befriends Becky, who begins to see a Newton she never knew existed.Horrified at the deception yet unable to stop it, Newton finds himself playing along with her preposterous stories, her attempts at reconciling differences within the family and her campaign for his promotion at work. Finally, he convinces Gwen to fabricate their "divorce" so he can still get married to Becky - until he has a change of heart. It's a delightful, warmhearted and intelligent comedy from director Frank Oz. 5.0 out of 5 stars... this is a cute movie and i have always liked it. okay so this is a cute movie and i have always liked it ...... but the real reason i purchased it ......I love the set decorating of this movie, hahahaha crazy reason to buy a movie, isn't it ? bet you have never heard of anyone getting a movie just to study the set layout and design have ya ? 5.0 out of 5 starsI've Loved this Movie Since I First Saw It! This is one of my favourite Steve Martin movies that nobody knows about! And Goldie Hawn is at her perky, comedic best (at least in my opinion). Rounding out the triangle (heh) is Dana Delany, who plays an uptight New England girl - who jilted fiance Steve Martin and then wants him back - to perfection. This is a movie with heart, tension, and lots of laughs! Rent (or buy) it, you'll be glad that you did! 5.0 out of 5 starsWitty, well-written, engaging, clean and fun. Recommend!! A great, if improbable, romp with iconic actors Steve Martin and Goldie Hawn. Great romantic comedy that is clean and delightfully dated. Witty, well-written, engaging and fun. Recommend!! 5.0 out of 5 starsWhy I like this movie. Hilarious and romantic comedy about consequences of "stretching" the truth. It starts with martin building his dream house for girl friend and maybe future wife, shows her the house, asks her to marry him and she says "NO" This is when the fun starts. Martin is saying his dream house is nothing more than an empty monument to her rejection of his proposal. Hawn over hears and decides to move into the house, martin mentions where it's located and hawn is off and running. She gets to the house and starts fixing it up like, new funiture, rugs, pics. etc. She has now told this little back woods town, martin and her are married. Matin decides to sell the place, this is when he finds out that every one thinks he's married to hawn. It escalates from there. Throw in two street people that she knows and now are poseing as hawns parents. I think you get the idea about this movie. I wish more projects were assembled for this tag-team of born screwball comedy geniuses, because "Housesitter" offers a great display of how well Martin and Hawn work together onscreen. Their senses of timing are tremendous and both have a gift for physical comedy and wringing the best out of every line of dialogue. I disagree with the original Amazon staff reviewer (I believe the "official" Amazon review has since changed to a more positive judgment), I think this movie is very well constructed, with a tight plotline and just the right balance of jokes and exposition. Not a word or scene is wasted. The humor is absurdist but good-natured, as in older-style films, and the supporting cast does standout service. This is a very underrated comedy, in my view, and I give it a high recommendation for fans of either of these fine actors or zany comedy in general. A very refreshing change from in-you-face gross-out jokes and sophomoric scatalogical/sexual put-down gags that pass as "comedy" in so many films today. 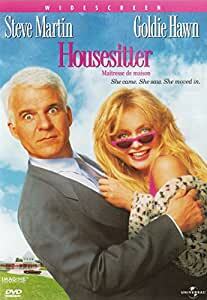 "Housesitter" just zips and zings along from one wild confrontation to another as the teetering house of lies constructed by Hawn (at first) and then Martin becomes ever-more unwieldy and incoherent. Dana Delany plays a prim, preppy "third wheel" character with aplomb and the finale is satisfying, funny, and endearing. Hugely entertaining and stands up tremendously well to repeated viewings! My wife wanted to watch this so I reluctanly joined her. It turned out to be a decent comedy. Both Steve Martin and Goldie Hawn played their roles well. The way they could spin tales on the fly to any and everyone was just fun to watch. Had me laughing pretty regularly. Also, since we live in MA, we kept trying to guess what city/cities they used for Dobbs Mills town. The architecture firm owner, don't know his name, was also very good. Dana Delancy plays this spiffy preppy woman, and I really didn't like her that much, which I think means she did an ok job. It was hard to figure out if the Director was trying to get you to root for her or for Goldie Hawn. Anyhow, it comes in at 90 minutes and I would recommend it to catch Martin and Hawn when they were still young enough to pull this off. A cute and zany rom com, "Housesitter" explores the world of an uptight straight man, frustrated in his personal and work lives. When Magic Pixie Dream Girl Hawn sweeps into his life and creates a fantastic fictional backstory for their romantic "marriage" (and her own colorful pedigree), Martin's character starts to see the possibilities when he realizes after his initial resistance that his coworkers, friends, and family prefer his "new" persona that Hawn has created for him. Martin and Hawn work beautifully together here, in a classic comedy that still remains well-paced and very, very funny. As their characters begin to grow into their fictional personas, it is easy for the viewer to become caught up in the fantasy of reinventing yourself, perhaps into the person you always wanted to be but never dared to become. 5.0 out of 5 starsStrap Yourself in for a Wild Ride! I rarely give a movie four stars and five is almost unheard of so you KNOW this one is a keeper!